I’ve been fascinated by tattoos for as long as I can remember; intrigued by the stories they tell, by their boldness and their permanency. I had my first one done around the age of nineteen, and whilst I can’t say it was the most profound of experiences (if I recall correctly I’d imbibed at least two pints of cider after a university lecture and had dragged my reluctant friend to the tattoo parlour with me intent on getting a dragon on my hip, but when we got there and they didn’t have any dragons in the book I opted for a four leaf clover instead – lucky I’ve never regretted it. But then, how can you regret luck? ), it set me on a path of discovery that I’m very much still following today. Each tattoo since that first one has held more emotional significance. The second, a literal translation of ‘inner strength’ into Cambodian script on my lower back, was done after a long term relationship ended badly in 2007, and I wanted to mark the start of my recovery by remembering the happy time I had spent alone in Cambodia before news of my ex’s infidelity broke. The next one came along after a stint of travelling in 2011. Written in English on my foot, it is the last line of a Buddhist prayer (‘May all beings be free), the full version of which my parents kindly gave me as a talisman on a necklace before I commenced my travels. On that trip I had a magical experience with a green turtle whilst diving in the Perhentian Islands off the coast of Malaysia, which I felt was relevant to the last words of the prayer (and hence also to the meaning of the tattoo). I also happened to meet the person I sincerely hope to spend the rest of my life with, who makes me feel more free to be myself than anyone I’ve ever known. And then there’s the newest addition to the tattoo clan. I’ve been toying with this one for a while, and it’s been particularly difficult because it is related to the thing I’ve struggled most with for the majority of my adult life: Writing. Some of you may know I went part time a year ago to focus more on my writing, but due to a severe lack of discipline on my part, ‘success’ (whatever that means) hasn’t materialised in quite the way I’d hoped it might. So I’ve recently decided to take off some of the pressure, to try and write ‘for love’ instead of fame and fortune. 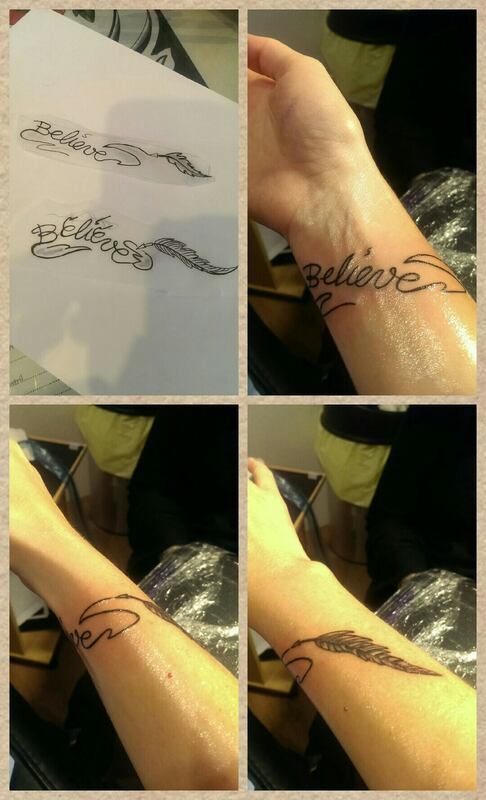 And to help me both with my writing and with the new transition I’m about to make to life as an expat in Brussels with my partner, I decided one more tattoo was appropriate – this time the unambiguous word ‘Believe,’ written as if by a feather quill, which is also included in the design, and which stretches over onto the top of my arm. I’m sure none of my tattoos will be to everyone’s taste, but all that matters to me is that they are to mine. Not only that, each one (with the exception of the clover, but I love it nonetheless) marks important stages in my life – beginnings, endings, declarations of hope. Each to their own, I say. Maybe I will be embarrassed by them one day, when I’m old and wrinkly and they no longer look as good as they once did. But, like my wrinkles, my tattoos will go to the grave with me, and they will tell the story of adventures, of love, of aspiration: They will tell the story of a life well lived.